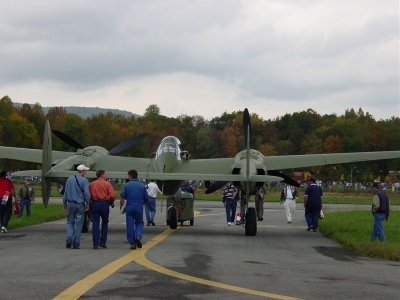 A site dedicated to the memory of those who designed, built, flew, and maintained the Lockheed P-38 Lightning in defense of freedom. 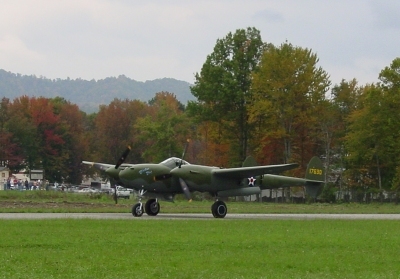 MIDDLESBORO, KY -- Some 60 years after landing on Greenland's ice cap and after decades being buried in hundreds of feet of snow and ice, a rare, perfectly restored P-38F took to the skies again, this time over its new home in Middlesboro, KY. 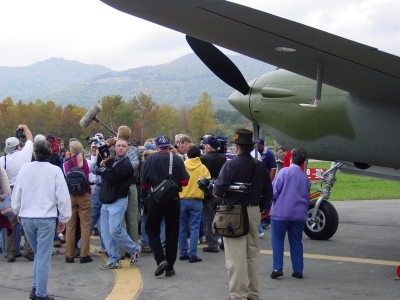 The story of "Glacier Girl" is fairly well know in aviation circles, and details can be found at the official site: www.thelostsquadron.com . 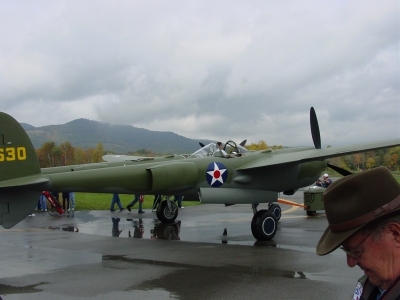 I have been following its progress since I first read about it in Bert Kinsey's book P-38 Lightning, Part 1 (In detail and scale series) four years ago. At that point, the restoration was already in its sixth year. 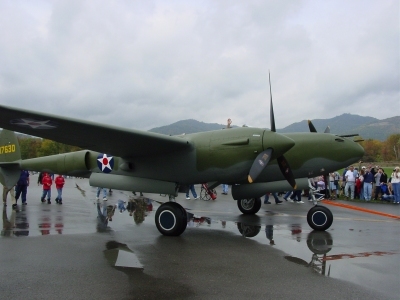 Having been enamored with the P-38 since my youth, I vowed that I would see Glacier Girl fly and as the big day approached I did all I could to make it there, despite living some distance away from south-eastern Kentucky. On Friday Oct 25, 2002, the day before the flight, I checked the "Lost Squadron" website to see if the flight was still on, as the weather did not look very cooperative. But, putting faith in the forecast for cloudy skies (but not rain), I began my 1,200 mile round trip to Middlesboro, driving the distance alone through rain, rain and even more rain. I had a great time waiting for the event. 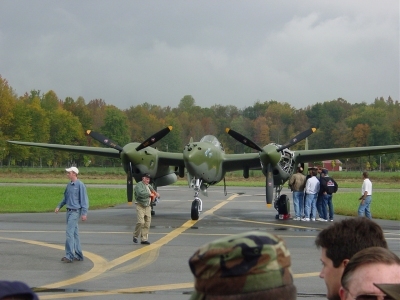 I met some P-38 pilots and other WWII veterans, lots of other people from all over the country and some local folks who had helped with the restoration project. When the ceremonies began, the MC stated that some 20,000 people were in attendance, lined up all up and down the runway, with probably several thousand in the main section, where I stood crammed with all the other nut-cases that got there 6 hours before! My impressions? Awesome. I don't use that word very much, because it is overused. But, I was truly awestruck by the accomplishments spoken of during the ceremonies. Everything from the brave pilots and crew of the "Lost Squadron," their rescue and rescuers, the recovery efforts in Greenland, the 10-year, incessant restoration, the extent of detail to get everything perfect, the support of the local community and citizens of Kentucky to help sponsor the project, the brave pilot who was to fly it -- it was all awesome. And then the plane stole the show, as expected. 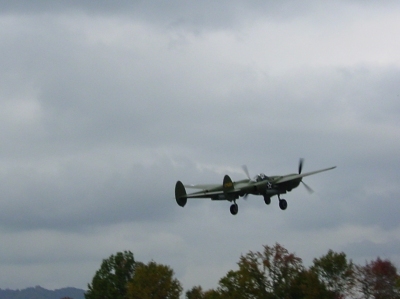 After a slight delay (weather related) the plane was pulled out and away from the crowd. The ground crew checked it over and the pilot got in and started her up. The crowd went wild with the start of each engine. The reaction of the crowd was almost like one hears at a sporting event when the winning team scores, or at a rock concert when the band plays an old favorite. 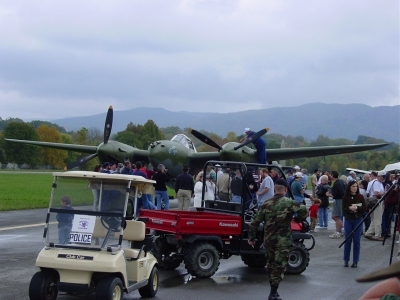 After warming up a little, Glacier Girl -- flown by noted warbird pilot Steve Hinton -- taxied and prepared to depart from runway 10 to the east. For a few minutes, the plane was out of my site. Then we heard a low rumble, which quickly grew louder. Pretty soon people began shouting, "here it comes!" 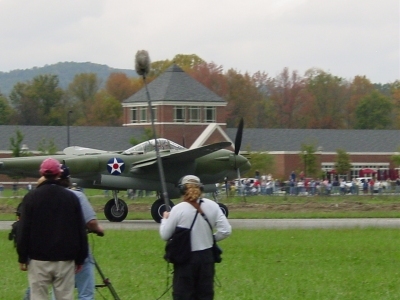 The sight and sound of that P-38 taking off is truly a moment frozen in my memory. 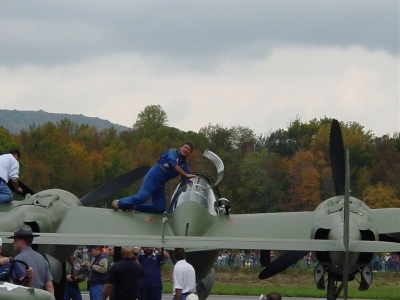 Having put so much effort into studying, modeling and "virtually" flying the P-38, this was actually a very emotional experience for me. It was hard to hold back tears of joy. A tingle shot down my spine as I reminded myself that this was the real thing. This was history in the making! I looked around and saw several WWII veterans with handkerchiefs to the moist eyes. I'm sure many of them have a very different kind of fondness for the plane, one that I cannot fully understand. The pilot handled the plane very gingerly, and rightly so. 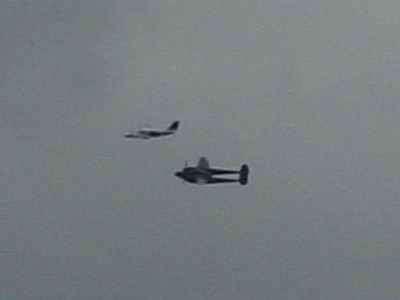 A T-6 (flown by the P-38 restoration project leader, I believe), which had taken off moments earlier acted as the spot plane and met the P-38 as it came around its first left-hand turn from take-off. The flaps and gear were tested as they went around the first time. Another plane (a Kingair, maybe?) 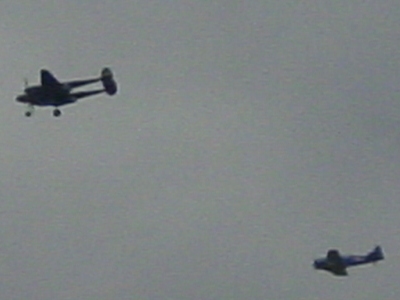 which had brought the Governor of Kentucky to the ceremonies then moved in and flew close formation with Glacier Girl. I'm guessing this was for in-flight photos and perhaps the History Channel (and I believe The Governor was on board). 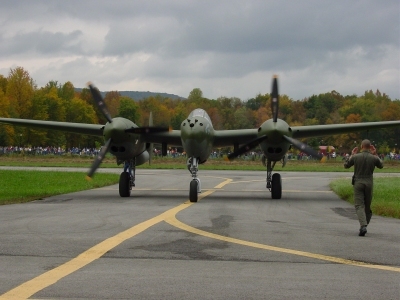 After that, the P-38 circled a few more times, making low passes as it approached the airfield, allowing all us spectators to snap photos and cheer wildly. 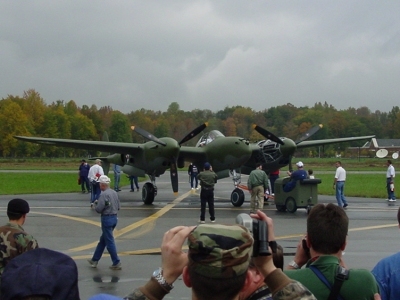 Finally, the gear came down and the P-38 landed. Again the crowed roared. It was over. 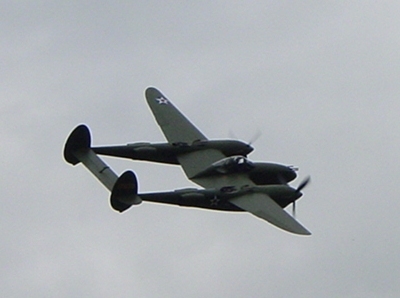 I had finally seen a P-38 fly. Below are some of the photos I took during the event. I took many close up photos of the plane while it was still in the hanger. Those are included in the "Walk-around" section of this web site. Be sure to click on the two short MPEG videos I took. They're not great quality (they're from my digital camera, which is much better at taking stills) but they give some sense of the excitement of being there. Several hours before the flight, the crew pushed the plane out a ways to test the engines. Note the bare left engine. Click here for a low-res MPEG video during engine test. 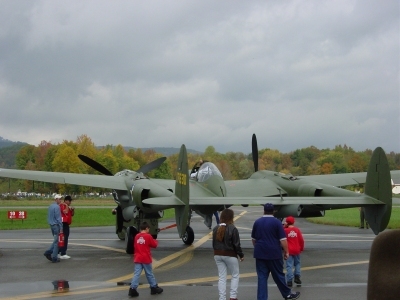 The sun came out a bit, giving a better sense of the true color of the restored P-38F. About an hour before the flight, they towed the plane to the fuel area to gas up. Note the boom mic on the left and the camera. That's the History Channel crew. Returning to the taxiway after fueling up. As you can see from this photo and the others, Middlesboro is essentially in a bowl-like valley, completely surrounded by hills. It is believed that the bowl is a meteriorite crater. 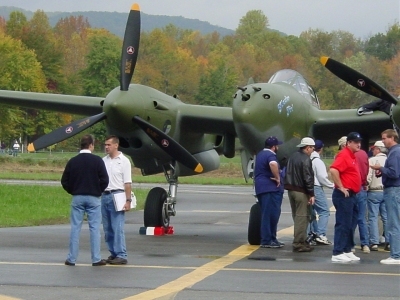 Note the flat paint (not gloss), painted exactly to original USAAF specifications. With the left engine covers on, the plane is ready to go! Being towed out a ways before starting engines. 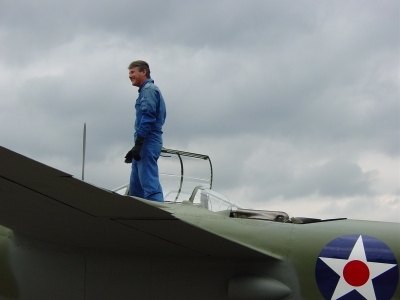 Pilot Steve Hinton climbs in. 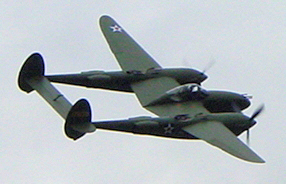 (Note the canopy folding to the right, indicative of the early-model P-38s. 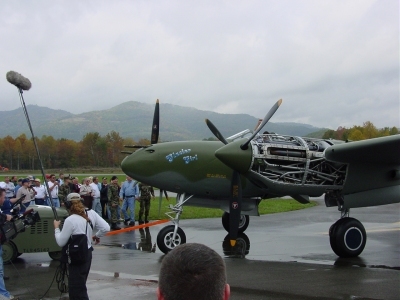 In fact, the change to the rear-swinging canopy was made during F-series production, so Glacier Girl is an early F (P-38F-1-LO 41-7630). Kentucky Governor's plane flying close formation, presumably for photos. Gear down, ready to land. The other plane is the chase plane. Seconds after touch-down. There's the History Channel crew again! Coming back, the crowd is cheering! Pulling up to the crowd. Great shot showing the use of differential throttle & brakes for steering. 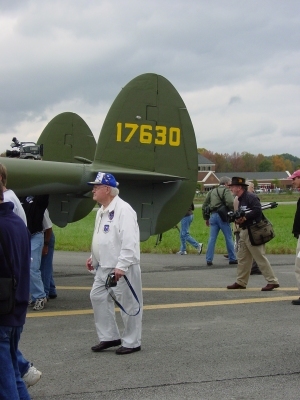 I was told that this gentleman in white was one of the original crew of the "Lost Squadron." 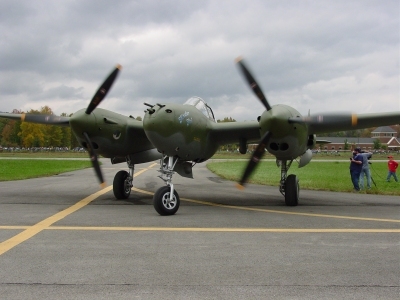 On the left side of every P-38, just below and forward of the cockpit, the plane's type, serial number and other details are stenciled in black leters for identification purposes. 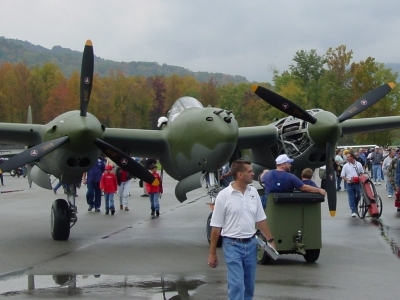 If you ever see Glacer Girl up close, you will notice it is marked as a "P-38E" but it is considered a P-38F-1. Apparently this was how it really was. When I asked about it during one of my visits, I was told this was because it was originally ordered as an E but during production it was built as an F. The restoration crew faithfully restored every aspect of the plane, even little quirks such as this. Copyright © David C. Copley 1999-2013. All Rights Reserved.